This is another version of the battle found at the end of “The Hobbit”. This is not a remake of the LORE or TSR version by Larry Smith. This is the same battle and played in a similar way (most wargames are), but a completely different set of game play. This is the battle that takes place in 2941 during the Third Age of Middle Earth. The battle takes place after the dragon Smaug has been killed by the men of Dale (Bard was the one who actually killed him) and the Dwarves, Elves, and Men have come to claim the Dragon’s hoard. At the same time, there is a race war between the “good guys” and the Goblins and Wargs (evil wolves basically). The battle takes place at the foot of the Lonely Mountain (Erebor) where the twelve Dwarves and a Hobbit (Bilbo) are entrenched. The Men and Elves are waiting outside the Front Gate. The Goblins and Wargs, under the command of Bolg, attack them from the North. There are also additional Dwarves coming in to assist the others in the mountain and are setup at the Northeaster spur of the mountain. The Game is played across a full-colored mapsheet representing the battle plain and the mountain sours. Players either control the Dark Army or the Free Peoples using die-cut counters representing the Elves, Men, Dwarves, Great Eagles, Goblins, Wolves, Wargs and various Leaders and Characters present during the action. The rules are divided into three parts; the Basic Game, the Standard Game, and the Optional Rules. These add complexity, flavor, and realism of the simulation. Basically, the game is played like other wargames with melee attacks backed by missile (archery) attacks. The Basic Game consists of a Move Phase, Combat Phase, Fire Phase, and a Fire/Combat phase. 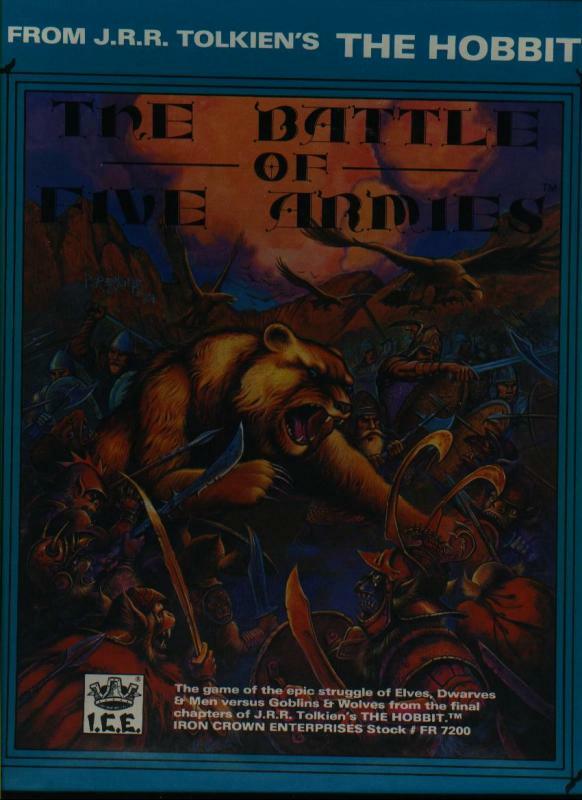 Like the LORE/TSR BOT5A game, this game has no Zone of Control typically found in wargames. The Standard game adds Line of Sight, Morale Check, Regrouping, and Swooping Attacks (by the Great Eagles). There are also Rock Rolling Attacks and Assaults (a stronger attack). Also, Gandolf has a fire spell that he can conjure up that is similar to a missile attack. The Optional Rules include the Bat Attack, Multiplayer Rules, Thorin can initiate an attack from the Front Gate, Hysteria can affect the charaters, the Goblin Leaders can come back after an attack, Variable Reinforcements, Additional Stacking, Extra Elves, and Extra Turns. “The problem of design was representing a situation where a few have a good chance of prevailing against many. The DARK PLAYER should not be discouraged at losing quite a few counters, for he can easily afford losing at a ratio of two to one. His best chance is to isolate rather small groups of the Free Peoples. Sometimes this can be accomplished by planning; more often than not this comes about because of the luck of the draw. The Dwarves are awesome. If backed into a large circle, they’re tough enough to concentrate against. Use the sprearmen on them. The Front Gate is very hard to take; this is as it should be. Once isolated, the defenders can be softened up with bow fire. The FREE PEOPLES PLAYER faces an interesting dilemma. At the start he holds 3 victory hex/areas. Remaining spread out makes it easier to lose one. The 2 tribes coming over the top are the weakest; they often don’t require much attention. Rushing off the mountain has been played with both success and abysmal failure. Don’t allow yourself to be cut into too many little pieces. If present in strength, don’t be afraid to pull into a circle. Because of the melee rules, the Goblins are enticed into closing. If they do so with bad timing, they can be cut to bits. All in all, I like this game more than the LORE/TSR version. While the basic gameplay is the same, the added rules make this game more true to the book, and more fun to play. - And the pieces that you play the game with.